When stepping through the front door of Oceania villa, you will be met by beautiful scenery from the living room and on to the incredible infinity pool and beyond to the dock on a beautiful cove. 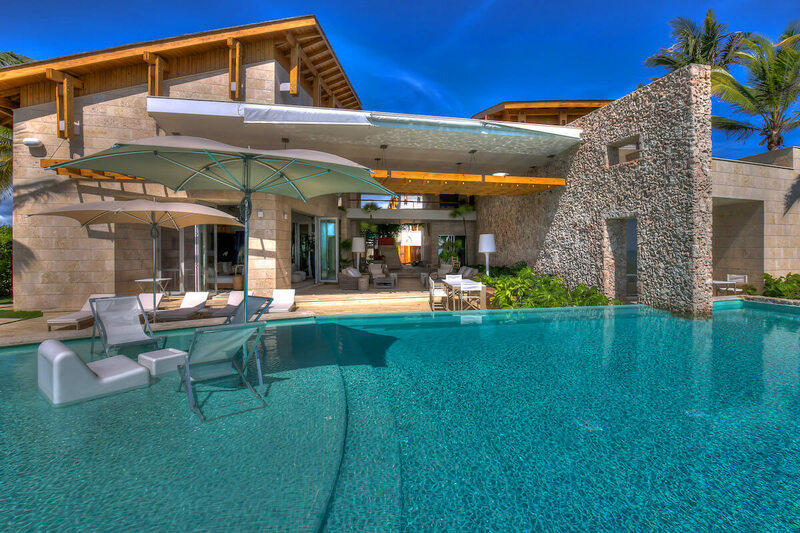 Oceania Villa is a 5 bedroom luxury villa designed by a famous Venezuelan architect and reflects pure Caribbean luxury and comfort of a 5 star home. The Master bedroom #1 and second Master Bedroom #2 are equipped with 1 king size bed, bedrooms #3, 4 and 5 are equipped with 2 queen size beds each for a total of 8 beds. All bedrooms are en suite and equally equipped with their own flat screen TV, cable, DVD, their own private bathroom, toilet, shower and walk-in closets and a nice little living area with a sofa arrangement. The rest of the villa includes a spacious and fully equipped kitchen, gorgeous living spaces, top notch dining room, 2 TV rooms, high speed WiFi internet, Fully equipped GYM, sandy area with a dock to step right into the water. 2 Kayaks are also included in the rental price.